Because we are the leading A-Level Economics tuition centre in Singapore and the first place students turn to when they need help securing their distinctions for university entrance. The centre is a one-man business so that Anthony can deliver the lessons directly, ensuring each and every student benefits fully from his guidance. Because Anthony is one of those special Economics tutors gifted with the ability to deliver results. Every year, about half of Anthony’s students score As, with the total number of As and Bs totaling 85%. Because Anthony is highly qualified as an A-Level Economics tutor. The former MOE school teacher holds a Masters of Education from Monash University, Australia and is studying for a PhD in Education. Because Anthony knows what he is talking about. Even other JC Economics tuition providers and MOE teachers use the guidebooks he writes. To date, he has published 18 guidebooks that are sold locally and overseas, including in local JC school bookshops. The most popular titles are the annual GCE ‘A’ Level Economics H1 and H2 Ten-Year-Series, which are sold out by July every year. The guidebooks focus on specific skill sets such as model essays, diagram drawing, evaluation points and the Singapore economy, and are meant to complement the TYS. Other titles cover parts of the exam paper such as structured questions, data response questions and essays. Because students at JC Economics Education Centre get notes that others don’t. All students exclusively receive comprehensive notes which offer complete coverage of the A-Level Economics syllabus and exam-smart techniques. These come direct from Anthony, author of the GCE ‘A’ Level Economics H1 and H2 Ten-Year-Series under license from University of Cambridge Local Examinations Syndicate. Because Anthony teaches students to apply Economic theory to the real world, so that their essays shine. He guides students to learn more about developed countries such as USA and Japan, and developing countries such as China, India and Vietnam, in order to apply real-world scenarios in their essays. Special focus is also given to the Singapore economy. Recent economic crisis such as the sub-prime crisis and the European debt crisis are also key features in the Economics lessons. Because students learn to give answers that Cambridge examiners expect. Anthony teaches the proper essay writing and case study skills so students work efficiently in their learning. His students learn how to score Level 3 (L3) marks for essays and he imparts the secrets to scoring full marks for the data-response type questions in case studies. Because the conducive classroom environment is carefully tailored to smooth the progress of students’ learning. 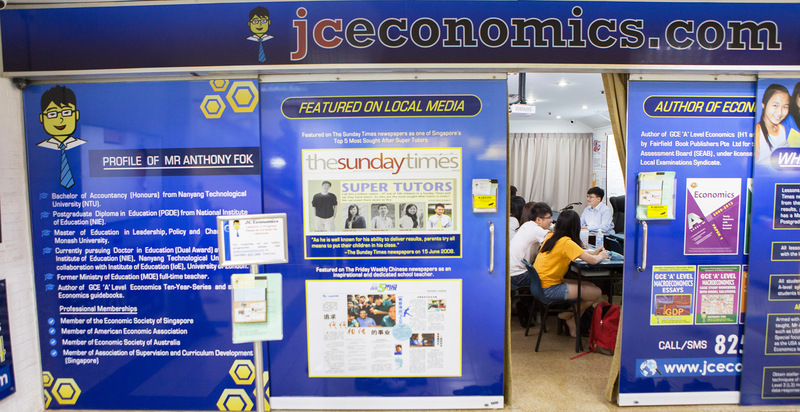 All classrooms are air-conditioned and fully equipped with whiteboards, visualisers and projectors to aid in the teaching and learning of JC level Economics. Students also have access to an extensive library collection of Economics textbooks and useful resource materials.